The tail of the crashed AirAsia flight QZ8501 has been salvaged from the Java Sea during the Indonesian-led search. So far, rescue teams have failed to find the flight recorders, which are now thought to have fallen off on impact. Divers used inflatable floating balloons to raise the tail from the seabed and a crane to load it onto the ship. "The tail has now been lifted,” said First Marshal S.B. Supriyadi with the National Search and Rescue Agency. 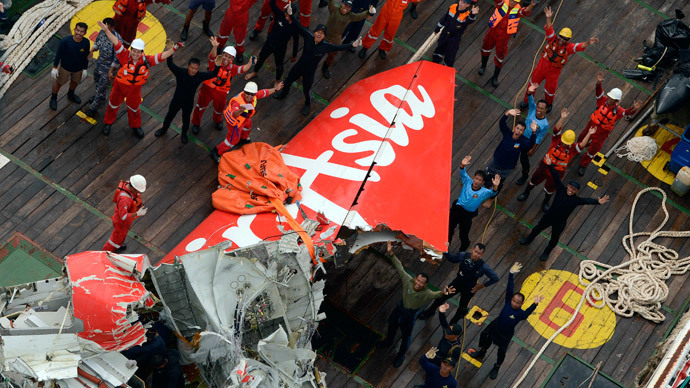 “We can confirm it’s from AirAsia QZ8501 and we can see the letter A on the tail. The condition of the tail is still in one whole piece." The tail section is the first significant part of the plane to have been recovered so far. It has been taken to the port of Kumai, where investigators will examine it for possible causes of the crash. 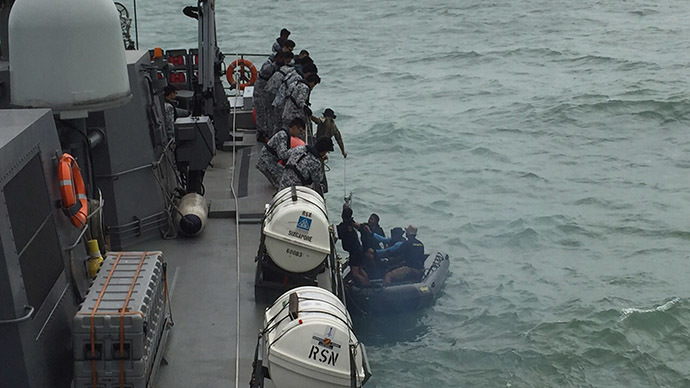 More precise information about what happened to AirAsia flight QZ8501 will come if the plane’s black boxes are found. Until the tail part was raised, there was a hope that the flight recorders might have been there, as it’s where an Airbus A320-200 normally stores black boxes. "Divers tried to find the black box while they were on the seabed, but they couldn’t see it. It might be due to poor visibility which [is] only three feet and also because of strong currents. Now it’s on the ship. 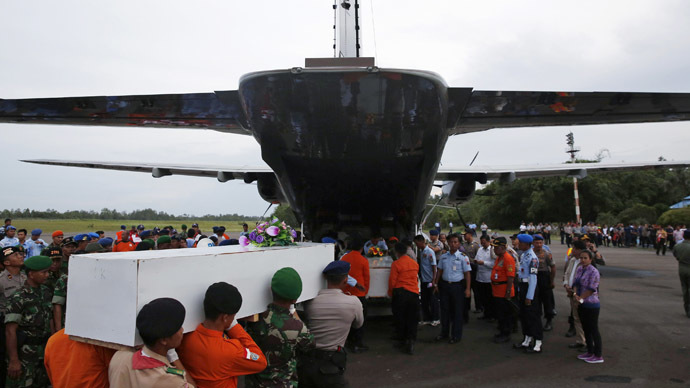 So we’ll try to figure it out whether the box is still on the tail part or has been blown away," Supriyadi said. On Friday, divers investigated pings, emitted from the recorders, which led them to the tail section. However, the pings were later found to have been coming from approximately half a mile away from the tail. Supriyadi said that they might have become buried in mud on the seabed because of the force of the impact. This means that while there are increased hopes the location of the tail could help solve the ongoing mystery of why the Airbus A320-200 crashed into the sea, it still remains impossible to track its final movements with precision. “We’re trying to locate the coordinates of the black box from the pings we detected. We’re trying to narrow down the search area to within a 500m (1,600ft) radius. 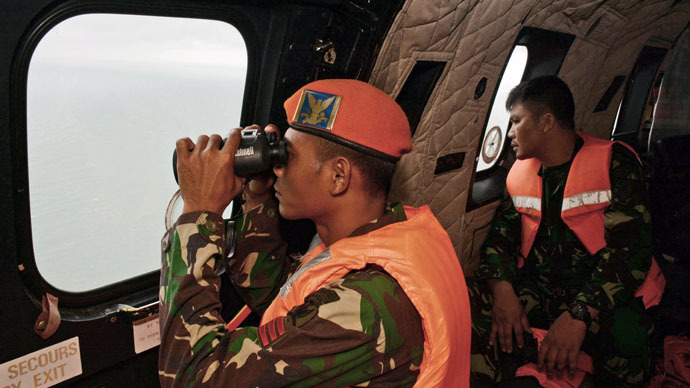 It’s impossible for us to search the black box without trying to narrow down the search area,” First Marshall Supriyadi said. Black box data recorders are designed to survive being submerged underwater and can give out “pings” for 30 days after a crash. The plane crashed on December 28 en route to Singapore from Surabaya, Indonesia. A total of 162 people were on board and there were no survivors. Forty-eight bodies have been recovered to date. An international team of planes, ships and personnel are continuing their search efforts. However, this has been hindered by a combination of bad weather and the location of the crash on a key WWII naval battleground, meaning old pieces of wreckage have caused confusion. 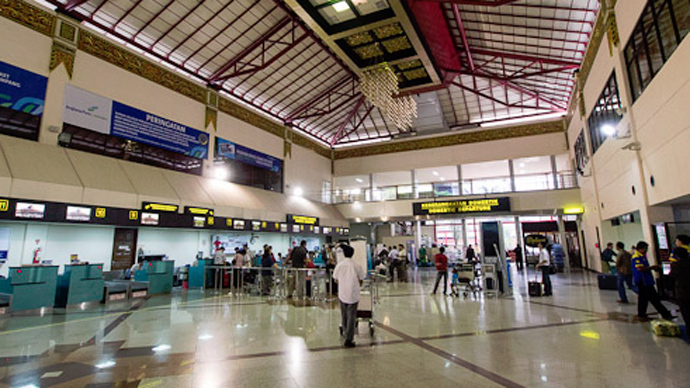 On Tuesday, the airline insurers were set to pay out compensation of 1.25 billion rupiah ($98,000) for each of the 155 passengers, and an additional 315 million rupiah ($24,700) to 750 million rupiah ($59,000) for the 25 passengers who had flight insurance.